Ahead of the return the hit musical, and audience favourite, Blood Brothers to the Edinburgh Playhouse this week (8-12 February), we caught up with Sean Jones who plays the role of Mickey. 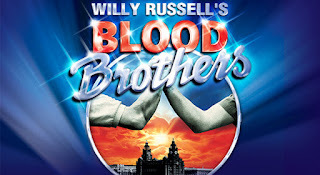 Jones is no stranger to Blood Brothers and his performance as Mickey is a favourite with fans of the show and critics alike. Hello Sean, thanks for joining me today, getting ready to pick up where you left off? Yes, and I’ve been going to the gym every day to try to keep myself in shape (laughs). This cast have been together a while now - do you have to rehearse as much as a new company would? Bet you can play this part in your sleep! I think because we’ve had a four month break we’ll probably have a couple of days rehearsing, but I doubt it will be very intense. We’ll get half an hour in and remember it all. Now you’ve been playing the part of Mickey for more than 15 years! How did it all begin? I’ve been in the show for 16 years on and off and been Mickey for 14. As for the character, it’s basically me but with drug addiction and jail terms thrown in (laughs). It’s very similar to myself, actually, I was expelled from school. When I first saw the show, it was because someone had said to me, you should go and see the show because there’s a part that you’d be right for. And when you’re a young actor you want to know what to market yourself on. So I went to see it, and it’s set in Liverpool which is just down the road (Sean is from north Wales) and I thought, “I get this”. The only downside of it was that it’s a musical and I’m not very musical theatre, I didn’t train to do musical theatre, had never done a day’s dance class in my life. But you eventually landed the part, your dream role! Well, it was very random, but I had this really crappy agent and they kept putting me up for these musicals and I actually started walking out of auditions because I hated singing. And finally, this agent said to me she’d got me an audition, and she said to me, “don’t be cross, it’s another musical.” I moaned but she said, “hang on, it’s Blood Brothers.” And she knew I was obsessed with the part of Mickey, but I never thought it would be something I’d be trying out for. She then told me the audition was for the part of understudy to Mickey and I thought, oh s***, I’m going to have to go for this, aren’t I? So I learned a song and went in and I thought, you know what, I’m in the producer’s office and I’m just going to go for it. And I really didn’t think I’d get it, I was shocked to get a recall and thought that was as far as I would get but then I got the understudy part! I understudied for two years and there was a tour going out on the road and begged to get another chance to audition for Bill. Eventually I did and I got it! And in this job, it’s very rare that you get to play a part that you want to play. For those who have never seen the show or know anything about it, without giving too much away, tell me about the story and about Mickey. So it’s the story of twin boys separated at birth and one stays with his working class mother while the other one is given away to a rich family, and that’s the story in a nutshell. The characters are growing up in 1960s and 1970s Liverpool and all that pertained to politics and class divide. I suppose it’s an examination of nature versus nurture and how nothing goes right for Mickey, he gets expelled from school, he goes on the dole because of the unemployment situation at the time, while his twin brother who was given away has a great education and goes to university, but fate keeps pulling them together and they become really good friends. But as they get older, the differences between them become more stark. You play Mickey as a child and then as a grown man - how do you manage to plays those two different generations so well? First and foremost, it’s the writing. Willy Russell has written the part of a seven-year-old boy perfectly, he really understood what the essence of playing that age is, so I think the writing primarily helps. But then also in Bill and Bob (Tomson) directing it, they won’t just let you put on a silly, childlike voice and walk like a kid. What they want is to find the essence of being that age, because the whole thing about the audience is to have them suspend their disbelief because it’s storytelling, it’s make-believe. So in as much as a kid can put on show for you and pretend to be adults, it’s the same with Blood Brothers. I run on stage in a baggy jumper and I sit on the edge of the stage and tell the audience I’m seven-years-old and they’ll accept it. As long as I am giving the right amount of energy then they’ll just go along with it. They get so engrossed in the characters they forget they’re watching adults. This leg of the tour continues and, with the exception of a couple of new members, you’re the same cast that’s been touring for the last year – you must be like one big family. Definitely. And there are some people in the cast I have been working with since day one, like Danny Taylor, me and him started our journey on the same day 16 years ago. But we actually go further back than that, me and Danny were both on the YTS scheme at the Theatre Clwyd when we were 17 and worked in Hamleys and Harrods – we can’t get rid of each other! (laughs) But the cast are like a big family too and it’s brilliant because it’s very vibrant and good fun. It’s very down to earth with a lot of banter behind the scenes. I understand you’ve also worked with all Nolan sisters as well (Denise, Linda, Bernie and Maureen) which is quite an achievement. Yes, I’ve had them all! (laughs). I know them all so well to the point that we became very close and when I worked with Linda, I stayed at her house one weekend in Blackpool for a little family holiday and we called them our showbiz mothers. Bernie was the first one I worked with and I remember her walking around the corner backstage and thinking, “oh my god, it’s a Nolan sister” because they are all so recognisable, and being in awe of her. You’ve no doubt played a lot of venues across the UK with the show, but are there any on this autumn leg you’ve not been to? And how do you find touring with a young family? I’ve never been to Weston-Super-Mare, so I’m looking forward to that. My family used to come on the road with me, the missus (Tracey Spencer who played Mrs Lyons) used to be in the show as well – before and after Elinor (their little girl) was born. And now Elinor’s in school, they’ll visit at half-term and maybe the odd weekend if we’re close to home. But this leg of the tour is quite southern-based so it’ll be tricky, but I’ll be going home every weekend. Thanks for joining us Sean, we're looking forward to seeing the show in Edinburgh. For tickets and information visit ATG Tickets.